One night last week I found myself cooking for my band of teenagers. KG was working late and it’s never tempting to cook imaginative food for that fussy (but always starving) bunch. Sometimes you just have to cook for the crowd you have. After a quick inventory of the fridge and pantry (lots of bread, eggs, milk, ham and cheese) I decided to make Monte Cristo sandwiches. I have no idea where the idea came from. I have never made them at home and the only time I’ve ever ordered one in a restaurant was at the Homeport Restaurant in Orleans when I first moved to Cape Cod more than twenty years ago. But somehow I knew that the combination of a ham and cheese sandwich, grilled French toast style would appeal to my crowd. It did. In fact they loved them. I topped them with a fried egg because that’s the way we roll. Drizzled with a bit of pure maple syrup, it was a surprisingly satisfying meal that I will definitely make again. I did a little research about Monte Cristo sandwiches and learned that the history of them is up for debate. They are believed to be a variation of a French dish called Croque Monsieur, served in a Parisian café in 1910. Those sandwiches were made with Gruyere cheese and thinly sliced ham – and get this (! 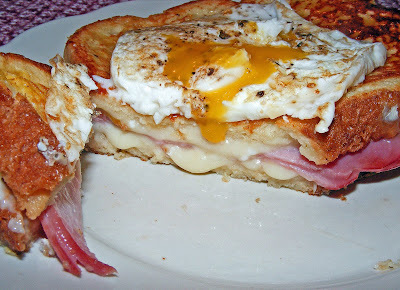 ), there is even a variation called Croque Madame that came with a baked egg on top. Pretty cool, huh? On this side of the pond, variations of Monte Cristo sandwiches appear in cookbooks from the 1920’s through the 1960’s, but the name Monte Cristo appears to have originated in California, notably the Coronado Hotel in San Diego (date unknown) and Gordon’s on Wilshire Boulevard in Los Angeles on their 1941 menu. It took Mickey Mouse to make them truly famous. They appeared on the menu at the Blue Bayou Restaurant in New Orleans Square at Disneyland in 1966 and became a very popular standard that they still serve today. I learned all of the above information at www.foodtimeline.org, a dream website for food geeks like me. Created by Lynne Olver, a reference librarian at the Morris County Library in Whippany, New Jersey, the website is an extensive compilation of foodie facts with cross links to other sites and reference notes for true food historians. Make four ham and cheese sandwiches. Beat 2 eggs, add milk, salt and pepper and mix well. Heat griddle to medium. Put butter on non-stick griddle and spread it with a spatula to cover surface. Dip each sandwich in egg and milk mixture, flipping then over once to saturate both sides and place them on the griddle. Cook until golden, about 4 - 5 minutes, then flip and cook for another 4 - 5 minutes. Bread should be golden brown and firm to the touch on both sides. Transfer to plates and cook four eggs over easy or to taste. 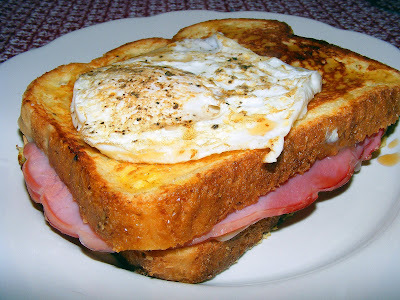 Top each sandwich with a fried egg and drizzle each with 1 tablespoon of real maple syrup. Yum! Ouch! I think my arteries just hardened. I used to adore Monte Cristos (or is it Monte CristoEs?) when I was a kid, but we never had eggs or syrup on them. I was obviously a deprived child. Also, there is (or at least, there used to be) a Homeport restaurant on Martha's Vineyard...I wonder if they're kin? When at Disney we always go to Blue Bayou for the Monte Cristo! Yours look so good! I love these, especially with an egg on them! YUMMMY!!! Looks like a great Monte Cristo Sandwich. A great way to start the day. I was thinking of Monte Cristo sandwishes for one night this week and now you have me sold. Your sandwiches look wonderful; I'm wanting one right now! Hey Laurie! How are ya kiddo? Gosh the last time we talked it was ice cold out, now it's finally starting to warm up, yes! I love monte cristo's but of course I dip mine in batter and fry those babies right up. Nothing like deep fried goodness, right? Are you doing a lot of writings? Well, I'm on my way to cross the bridge and shop at whole foods. yes! Here I sit, past breakfast time, and my tummy growling...what do I see but your Monte Cristo sandwich. It looks SO delicious!! I have never had a monte cristo, but I do like a croque monsieur (always with some mustard in it). Your pictures of them are amazing! Weeeeeeeeeeee, cheese, butter, ham, eggs. Love! Monte Cristo? More like a Croque Madame truly with the fried egg on top.